The Koeye River Estuary is one of the most outstanding estuaries in British Columbia. 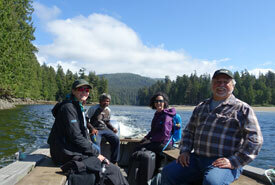 It is listed as a Protected Area under the Great Bear Rainforest agreement. Together with the adjacent Namu watershed, the Koeye represents one of the largest complexes of ancient forests on the Central Coast. In December of 2005, the Nature Conservancy of Canada (NCC) purchased a 165-acre (67-hectare) parcel of private land on the estuary of the Koeye River. 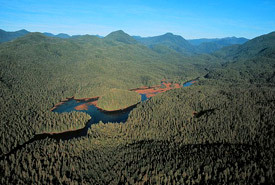 The Koeye estuary contains exceptional ecological features, such as old-growth forest, grizzly bear and salmon habitat. These are all characteristic of the pristine Koeye River watershed. The protection of the Koeye River Estuary property was made possible by a generous gift from the Tula Foundation. NCC also thanks the Vancouver Foundation, the David and Lucille Packard Foundation, an anonymous donor and the Endswell Fund of the Tides Canada Foundation, for their support of our work on BC's central coast and northern landscapes.